Please, Herr Krugman, May I Have Another? WHEN GERMANS VOTE in next year’s national election, they will have the choice between two candidates who hold the distinction of having been repeatedly insulted by Paul Krugman. The New York Times columnist has a habit of accusing Angela Merkel of dim-wittedness, questioning her “intellectual flexibility” and accusing the members of her government of “living in Wolkenkuckucksheim—cloud-cuckoo land.” Krugman has treated Peer Steinbrueck, her Social Democratic competitor for the country’s highest office, no better. The austerity policies embraced by Steinbrueck, who was Germany’s finance minister in 2008 and 2009, were pure “bone-headedness”; his speeches criticizing deficit spending were “know-nothing diatribes.” Krugman even went so far as to compare Steinbrueck’s ideology with that of the least popular political group, in contemporary German eyes, after the Nazis—the Tea Party. And yet, it’s equally apparent that Germans aren’t impressed by his vitriol, nor are they much persuaded by what he has to say. When Krugman suggested the international community impose “sanctions” against Germany for its monetary policies, a number of notable German economists publicly, and sternly, pushed back. When Krugman accused Wolfgang Schaueble, the country's current finance minister, of “just making stuff up” when discussing the Euro crisis, Schaueble told the press that he had “no use for” economists with Nobel prizes. And when Krugman received a major award from one of Germany’s most prestigious economic research centers in 2010, the organizers made sure to pair his remarks on the European crisis with a speech by Schaeuble that undermined everything he had to say. 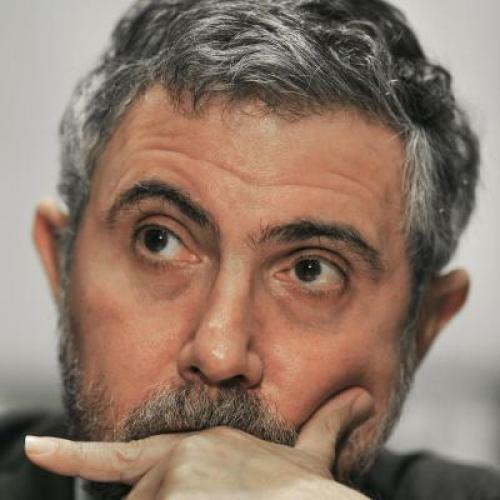 The relationship between the popular Times columnist and the dominant European economy has thus settled into a stable, if neurotic, pattern: Krugman attacks Germans for their economic habits and trashes their most beloved public officials; in response, Germans wince, complain, and then ask for more. Irwin Collier, professor of economics at the Free University of Berlin (and a friend of Krugman’s from their graduate-school days at MIT), admitted that it was unlikely that any of those students who line up to hear Krugman speak at universities actually change their minds after engaging with him. According to David Marsh, chairman of the advisory board of London & Oxford Capital Markets, it’s not a surprise that Germans would volunteer for such punishment. “Krugman is part of the ritual of self-criticism in Germany,” he tells me. “There is a tendency in the culture of self-flagellation.” But that doesn't explain how a Nobel Prize–winning economist got involved. If Germany has a national penchant for masochism, why did Krugman become one of its primary public enablers? Krugman is not alone in his confusion. The philosophical touchstone of contemporary German economics isn’t the work of Adam Smith, or Hayek, or Marx, but rather Walter Euken, a man whom few outside of Germany have ever heard of (though he’s so well-regarded in his own country that his face has appeared on a German stamp). In the 1930s, Euken founded a school of economics at the University of Freiburg that came to be known as ordoliberalism. It combined a commitment to free markets with a belief in strong government, but its primary economic concern was stability—understandable in a country scarred by the experience of hyperinflation in the 1920s, the depression of the 1930s, and the subsequent rise of Nazism. When West Germany needed to create a state in the aftermath of World War II, the ordoliberal theoreticians set up the “social market economy” that became the country’s unquestioned economic framework. They created a robust welfare state, but it was embedded in a legal structure that was engineered to promote economic stability—rules for balanced budgets, rules for labor participation in the workplace—and ideally wouldn't require continuous intervention by the state. The flip side of this obsession with rules was a distaste for the sorts of pragmatic responses to crises preferred by American economists. That’s why many Germans still tend to embrace “automatic stabilizers” like unemployment insurance, but shy from discretionary spending, like massive stimulus packages. They would prefer to suffer short-term pain now for the promise of arriving at a more sustainable equilibrium later. And worst of all for Germans is the idea—not at all unusual in Anglo-Saxon economic literature—that inflation can help lift a country out of an incipient depression. Germans hear the word inflation and think only of their worst nightmare: instability. That explains why “Germany has very few influential Keynesian economists,” as a recent report by the European Council on Foreign Relations put it. Olaf Storbeck, economics correspondent for the German business daily Handelsblatt, is somewhat more blunt: “Keynesianism is a dirty word in Germany,” he says. And yet Krugman eats, and eats well, in all of those places—partly because he is still managing to dine off of the reputation he earned as a political critic of American conservatism. Krugman was largely anonymous in Germany through the 1990s, but Germans fell in love with Krugman, as many American liberals did, around the time that he became a loud critic of the Iraq War and the Bush administration’s fiscal policies. “His general position on war and the welfare state matched the consensus in Germany,” Storbeck says. “The German public thought he was anti-Bush,” Collier tells me. “So they fell in love with him as the good American.” Europeans across the continent—including those on the Nobel Prize committee—swooned for Krugman. Since then, though, Germany’s relationship with Krugman has soured, and in a way entirely peculiar to that country. As the global economic crisis got underway in 2008, Krugman shifted the focus of his economic writing from tax policy and health care to stimulus spending and inflation. But Krugman’s talk of “aggregate demand shortfalls” and “liquidity traps” was lost on most Germans. In other European countries, Krugman’s Keynesian prescriptions tended to divide the political parties against one another; in Germany, “Krugman holds up a mirror to the entire nation,” Marsh says, casting it in harsh light. The country’s love for the columnist quickly curdled into a feeling of betrayal. That’s not to say that Krugman’s anti-German turn dimmed the country’s interest in his work. Both of Krugman's most recent books—in which he criticizes German policy at length—have been bestsellers there. But his promoters have been forced to adjust their marketing strategies. In the United States, the title of his latest book is a simple exclamation framed as a sober demand: “End This Depression Now!” In Germany it arrived on shelves with a vaguely polemical subtitle, “Why We Have to Spend Money Now.” And though Krugman received an award from the country's most renowned economic think tank in 2010, at the height of his criticisms of German crisis management, the public citation of the award mentioned only those books written during the Bush administration. “The thing is, I like Germany,” Krugman says at one point in our conversation, as if to apologize for some of the controversy he has triggered there. “I think it’s a lovely place and I’ve made good friends.” Indeed, when I speak with Collier, he admits that he and his German wife, a professor of psychology, insist that Krugman stay with them whenever he is in Berlin.